For the third year in a row, The Counseling Center was awarded the Recognition of Best Practices for achieving the highest level of satisfaction among those who make referrals for behavior health services. Karen Berry, CEO, was presented the award at the annual meeting of the Mental Health Corporation of America in February. 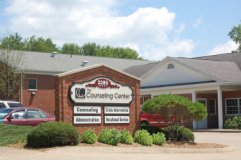 The Counseling Center also received, as it did last year, the award for Overall Best Practices for achieving the highest level of client satisfaction in provision of behavioral health services among organizations offering five to seven categories of service. Berry congratulated staff for this accomplishment and thanked them for delivering quality services that benefit many members of the community. The Lifeline is a 24-hour toll-free phone line for people in suicidal crisis or emotional distress. An online chat option is also available. National Runaway Safeline is open 24/7. ​By calling 1-800-RUNAWAY or 1-800-786-2929, you will immediately share your story with a compassionate person and build a plan together. The Counseling Center is supported in part by the Mental Health and Recovery Board of Wayne and Holmes Counties, Orrville United Way, United Way of Wayne and Holmes Counties, patient fees, grants and donations. Photographs on this page by Christine Allman, Diane DeRue, Jim Foley, Kristen Labbe, Dave Snyder and Don Robb.